Ulysses tells of the diverse events which befall Leopold Bloom and Stephen Dedalus in Dublin on 16 June 1904, during which Bloom's voluptuous wife, Molly, commits adultery. This has been the most difficult read of my life. I have never experienced such confusion whilst reading a novel, nor have I ever been this physically exhausted from reading. I was so incredibly proud of myself whenever I worked out what Joyce was driving at, but at the same time felt like such an idiot. It's arduous, frustrating yet rewarding at the same time; I cannot describe how accomplished I feel to have tackled this behemoth of literature. I do believe, however, a reread is in order at some point in the (very distant) future. Joyce does not make this easy for you. 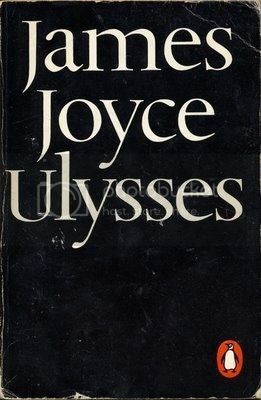 I imagine most reviews of Ulysses will be incredibly intellectual (or pseudo-intellectual) and deep. This review will be nothing of the sort; I don't pretend to be a genius. I struggled immensely with this book, and did have to research some of the sections to ensure I was in complete understanding of the plot. I am in no way ashamed of this, and I'm not embarrassed to say that I mostly didn't enjoy it. Our two main characters were terribly unlikeable. Although I found myself growing more and more fond of Bloom as the novel progressed, I never warmed to Stephen, finding him ignorant and a bit of an arse. I imagine had I read Dubliners in preparation for Ulysses I may not have had this problem. Bloom, however, was an interesting character, and I ended up pitying him a great deal. He works fantastically hard at pretending he isn't an outsider, and fights to remain in his social circle. His thoughts seem to bounce around his mind as though he is scared to dwell on one thought for too long. This seemed to relate to his suicidal feelings, almost as though thinking about something for longer than he should may have pushed him over the edge. Joyce's love of Ireland is very apparent in the way he writes this book. Dublin's streets come alive as this day pans out, and his comments on poverty, colonialism and religion really strike a chord in your mind. The novel is more of an accumulation of little nuances, rather than a saga with an important moral at its finale. Joyce doesn't end the story by tying up all the little loose ends and making sure we know everyone lived happily ever after. This was one day in the life of these characters. No one knows what is to come. They could have lived happily ever after, but they most probably did not. The writing is gorgeous, the style is varied, and people probably forget that this is a funny book. I loved that each chapter (or episode) had a different style, for example, one in the form of newspaper articles and one written as a play. One chapter (and the one I found most difficult to understand) was comprised of Joyce simply parodying various authors over the years. I loved the 'first-person narrative but not really' style Joyce had, allowing us to almost read the minds of our characters, and hearing them tell us the story without knowing they're telling us. This can be very difficult to understand at times, as the human mind does not think in a linear fashion, and random irrelevant thought-bursts could come at any moment. You are forced to decipher these as you see fit. It was not until Joyce introduced me to the idea of the 'parallax' (the idea that the same object can be viewed in entirely different ways from different perspectives) that I began to fully understand the narrative. I do not feel this is greatest novel of the twentieth century. I do not feel as though it is the greatest book ever written, and I don't believe in many of the things I have read or heard about it. I do feel, though, that one day I will understand it all. I might have to read The Odyssey first. I might have to throw in some Dubliners before I can completely invest myself. However, I can see the light somewhere; I can see where people are coming from even if I can't embrace it myself yet. This book is a labyrinth. You will need your wits about you. You will need time to sit down and absorb every word; I had to make sure I had time to read an entire chapter at once, otherwise I would pick it up again later and have no idea who these characters were or what in the world was happening. It is absolutely daunting in many ways, however I would recommend it. I just think there were too many puzzles for me to work out; I was exhausted, but I will absolutely try again at some point in the future. God loves a trier. 12 / 50 books. 24% done!